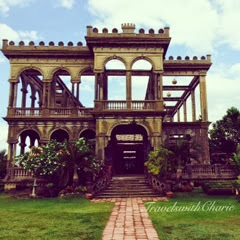 In a residential neighborhood of Talisay is this evocative architectural demonstration of love - The Ruins. When Maria Braga died in an accident in 1911 while pregnant with her 11th child, her husband, Mariano Lacson, built this house in her memory. There's no mistaken whose house this belongs to. The double M (looks like E backwards) on the columns and pillars are the initials of Maria and Mariano. The house which is reminiscent of European villas, is made of concrete which has the look and feel of marble as it was mixed with egg whites rather than water. The tiles were imported from Spain and have withstood years of exposure to the elements. The four tier water lily fountain is original to the property as is the sugar mill smokestack that is topped by a tree, a not so subtle reminder of a tower in Lucca, Italy.